Torta Rustica is Italian for Rustic Pie. Although I’m partial to sweets as you all may know by now, I particularly love this pie. Layers of vegetables in between pastry dough, resembling that of the Italian flag, this pie will satisfy and warm your tummy in the best possible way. Over the weekend I was so exhausted from my previous 2 weeks and felt like I needed extra nutrition, so I decided to make this pie. I didn’t take step-by-step photos thinking I had already posted this previously however, I only posted a photo of my first time making it and testing for a culinary class. I needed to tweek it a bit! I’ll do my best to give you step-by-step instructions so that you can recreate this savory pie for yourself at home. Feel free to make your own pie crust however, I chose to purchase the refrigerated Pillsbury crust. IMO it’s delicious, and if you don’t have the time it’s almost as good as homemade. Some will disagree and tell me they like it just as well if not better. Mise en Place all ingredients, this will make the prep work that much easier. Start by Roasting the Peppers, then Roast the Portabellas. Before roasting clean the portabellas with a damp paper towel, removing the stems. Rub with olive oil and sprinkle with chopped garlic (in the cavity) and roast or place under the broiler for about 5 minutes skin side down. Slice peppers into strips after peeling the skin off. Portabellas should be sliced into strips as well. Set aside until ready to assemble. Saute butter and shallots together in a skillet, remove from heat and add spinach, egg and Parmesan cheese to blend. 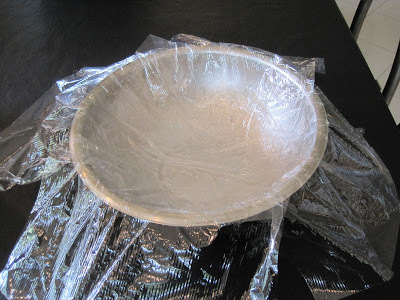 Roll out one package of dough to approximately 1/8 inch and lay into bowl pressing gently leaving dough hanging over the sides of the bowl. Sprinkle dough with bread crumbs. This helps to keep any moisture from coming through onto the dough, in addition to giving additional flavor. Layer 1/3 of the spinach mixture on the bottom, then place strips of red peppers, portabellas and fontina cheese, repeat layering, finishing with the spinach. Sprinkle top of spinach with more bread crumbs. You should have about an inch or so left to the top of the bowl. Roll out another piece of pie dough to the same thickness as before and place on top. Crimp the edges of the 2 pie crusts together and gently flip the bowl over setting it on top of a parchment lined sheet pan or pizza pan. Brush with egg wash (egg with a teaspoon of water combined), and bake at 375F degrees for 40 minutes. Slice and serve hot or at room temperature. Note: Feel free to change the vegetables to suit your taste, add bacon, ham or other meats and cheeses. Delicious! I love Torta Rustica and I’ll never forget the first time I made one (the only time I made one…I should make another). It was delicious! What a show stopper! I hope you rest up….but if this is what you come up with – Yahoo! It’s awesome! Thanks Ann. It really was what I needed. I felt 1000 times better after eating those veggies, and while a hearty salad could have done the trick the weather was chilly and this was warm and somewhat nutritious with the exception of the pastry crust and cheeses. Who cares a little won’t kill me and it’s really, really good! You should try making it again! I love your blog! I will definitely keep it bookmarked! Thank you Chris and Nicole! Nice recipe. I’ve seen a similar recipe where you substitute crepes for the pie dough, and place a crepe on each layer of filling. Your recipe is a lot easier! Thanks. @Kitchen Riffs – thank you for stopping by. I’m sure mine would be easier to prepare however, layers of crepes with the veggies in between sound pretty awesome to me. This is gorgeous, Vicki!!! I love the addition of mushrooms and bell peppers…so tasty! @LaMagicaZucca – thank you so much for your kind words. I’ll be stopping by your blog soon. @Lizzy – thank you for your kind words. It’s really delicious and not difficult to make,just a few steps and you’ve got a wonderful meal. Vicki, this looks to me like vegetarian lasagna in a pie! The green, brown and red layers are so eye-catching and I say that because I’m a very visual person myself :-). 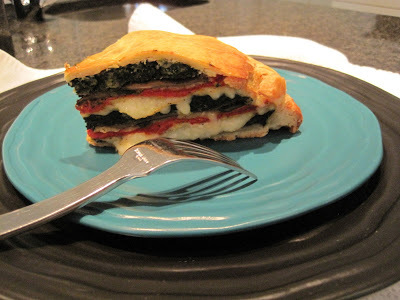 I’ve never had Torta Rustica before but after seeing this, a similar torta might materialize on my kitchen table soon! Such a lovely recipe, thanks very much for sharing it. I love this presentation, its amazing in color, and flavorful! I am bookmarking got to try this one! @Foodiva – thank you and please try it. You’ll love it and so will the rest of your family! @Pegasuslegend – thank you Claudia, the colors are so pretty and the flavor remarkable. Feel free of course to use whatever veggies you like or even throw in some ham or bacon, etc if you don’t just feel like veggies. You can’t go wrong. 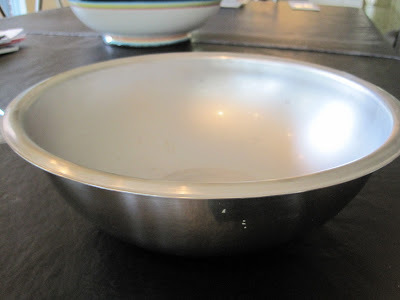 Plus it’s fun making it in the bowl vs. the springform pan. It’s just something different. I hope you’ll try it Patty. It’s so good! I have a torta on my bicket list of things to make. Please let me know when you make it Bellini I’d love to see it. That is a real beauty, and incredibly impressive. It would be such a fun thing to cut in front of guests and see their reaction to all those beautiful colours. It’s as delicious as it is pretty. Thank you for your kind comments. This sounds absolutely delicious! I love to see someone else using the ready-made pie crust! It sure has spoiled me, especially since I was never any good at making them. Love the vegetables that go into this pie. It looks beautiful and very tasty! @mjskit – I like the ready-made pie crusts. I don’t find a huge difference in the ones that I’ve made from scratch and the really good ready-made pie crust so why not use them and save myself the time. However, if I was wanting to make something for someone and be a perfectionist I might make my own. I’d have to think about it though. Thanks for stopping by my blog. Hope you’ll be back soon!